Wazamba Casino is a brand new online casino that was launched in February of 2019. The brand is a themed based casino where players can enjoy an exciting journey through Wazamba as one of three chacters; Bomani, Advar or Chimola. The fictional Wazamba is a tropical adventure land filled with riches and rewards and it does make a nice looking website that should be appealing to anyone whether you prefer to play on your mobile, desktop or tablet. Wazamba Casino’s games catalogue house more than 3000 titles which an incredible amount of games for an online casino. The contributing game vendors are many and include all top providers such as NetEnt, Play’n GO, Microgaming, Yggdrasil, BetSoft, iSoftBet, ELK Studios, Pragmatic Play but there are also a number of less known game producers including Red Tiger, Redrake, No Limit City and Habanero. The larger part of the game portfolio is video slots but there is also an excellent collection of card/table games, video pokers, live dealer games and jackpot slots. The game lobby is very simple to manage and there is no problems in locating any games in particular. The main tabs in the lobby are the different game types but also Provider (where the list of games is sorted by vendors like NetEnt, Yggdrasil etc) and a Top tab where the most popular games are on display. Wazamba Casino’s lobby also include a search function where the player easily can enter a game title in order to find it. The customer support at Wazamba Casino is above the average since they are operating 24 hours a day and they also have phone support (European players: +356 277 80 669, Russian players: 8 800 775 34 89) in addition to live chat and e-mail support. Wazamba Casino also have a great FAQ page where information regarding account management, bonus promotions, technical requirements and much more can be gathered. Wazamba Casino is available in English, Finnish, German, Hungarian, Norwegian, Polish, Portuguese and Russian. Wazamba Casino is owned and operated by Araxio Development N.V. and Tranello Ltd. They are licensed by the Government of Curacao. Wazamba Casino meets the highest standards of player safety, fairness and responsible gaming policies. Wazamba Casino: Get a First Deposit Bonus of 100% up to €500 + 200 Free Spins in Eastern Goddesses! As a new member of Wazamba Casino you will be able to enjoy a first deposit bonus of 100% up to €500 (2,000 PLN, 5,000 NOK, 150,000 HUF, 35,000 RUB, 2,300 TRY, 3,888 CNY, 770 CAD, 65,000 JPY) + 200 free spins in the Eastern Goddesses video slot. 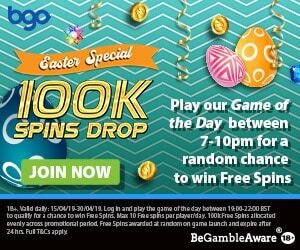 The 200 free spins are credited in batches of 20 per day for 10 consecutive days from your initial deposit. The minimum deposit for this bonus is €20. The deposit match bonus and winnings from the free spins are subject to a x30 wagering requirement. Click here and join Wazamba Casino and get 100% up to €500 + 200 Free Spins! More Bonuses available at Wazamba Casino! There’s a great set up of player promotions that you can participate in at Wazamba Casino. Following your first deposit bonus, you can get a Weekly Reload Bonus of 50 free spins, a €700 Weekend Reload Bonus, 15% Weekly Cashback and lots more. Make sure to subscribe to Wazamba Casino’s promotional send outs so you don’t miss out on even more treats. Wazamba Casino allows players to play in the following currencies: EUR, NOK, CAD, PLN, RUB, HUF, TRY, CNY and JPY. They accept all major payment methods including Visa, Mastercard, Neteller, Moneybookers Skrill, Paysafecard, Entropay, Entercash, Neteller, Ecopayz, SEPA, Payeer and several regional direct transfer solutions. All transactions and other stored information is protected by the most advanced encryption technology available. Popular Online Video Slots at Wazamba Casino! Wazamba Casino house a gigantic collection of more than 3,000 games. Most of these are online video slots produced by some of the most acclaimed game vendors on the planet including NetEnt, Play’n GO, Microgaming, Yggdrasil, ELK Studios, BetSoft and many more. Some of the most popular video slots at Wazamba Casino at the moment are Eastern Goddesses, Starburst, Book of Dead, Fire Joker, Twin Spin, Gonzo’s Quest, Dead or Alive, WildCano and Fat Rabbit.